Established in 2008, Blue Honey Friesians is a unique breeding & training farm comprised of Crown & First Premie Mares. It is our goal to ensure and maintain the quality of the Friesian breed while breeding for superior sport horses. We guarantee Quality & Grace by delivering superior bloodlines, conformation, & athleticism. 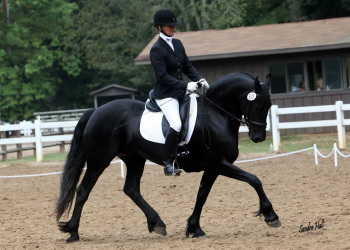 We implement an excellent and demanding training program including ground work and a high quality dressage program including training with Stacey Hastings.